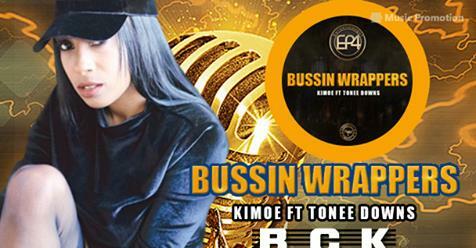 Bad Girl Kimoe, being a young hip-hop artist, has become a craze for the rap lovers. Her brand new release ‘Bussin Wrappers’ will fill you up with full of happiness. Boston, Apr 5, 2018 (Issuewire.com) – The songs from hip-hop and rap always approach to the real human lives. It has a different rhythmic essence to boggle everyone’s mind. It creates a free space within the human brain. BGK, also known as Bad Girl Kimoe, has become one of the most popular hip-hop artists of this generation. She has put utter strength in making her latest track ‘Bussin Wrappers’. It has been uploaded on Soundcloud for the listeners to enjoy. The artistic appeal of BGK in ‘Bussin Wrappers’ has made it an attractive number. She has made it with full of perfection where you will find no flaw. Once you start listening to it, you will get more and more reasons to hear it again and again. The positivity of this track will surely give you good vibes. ‘Bussin Wrappers’ has a satisfying smoothness which will make you go with the musical flow. Bad Girl Kimoe is a young rapper but is solely dedicated in creating unique musical pieces. ‘Bussin Wrappers’ is such a track which will bring peace to your mind and soul. This track has clear breaking beats mixed with groovy rhythm and riffs. The progression of ‘Bussin Wrappers’ is really enticing. It will create a musical atmosphere all around. BGK has very efficiently shown her unique creativity with the making of ‘Bussin Wrappers’. The simplicity of this track will make you enjoy it thoroughly. Listening to this track once will keep you hooked up with it for the entire day or so. The beautiful verses of this track will captivate the attention of every listener. ‘Bussin Wrappers’ will give you a different trippy effect for everyone to swing with. ‘Bussin Wrappers’ will drive you crazy over its alluring rhythmic structure. Tune into the official Soundcloud profile of BGK aka Bad Girl Kimoe and listen to this number to enjoy the perfect hip-hop groove.